Update: Bumped to the top again. GameStop is now listing this for $49.99 as opposed to $59.99. Update: Bumped to the top. Pre-orders are live on GameStop, and it’s confirmed exclusive. If you’re on mobile, the previous link may not work – try this one. 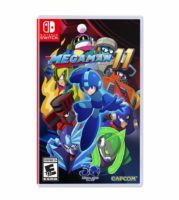 Capcom will release Mega Man 11 amiibo Edition in North America, the company has announced. It includes the game, the new amiibo, a “Stage Select” microfiber cloth, Dr. Wily logo adhesive patch, and a set of stickers. Mega Man 11 amiibo Edition will be available when the game launches on October 2. Based on an in-store listing, it will be a GameStop exclusive.